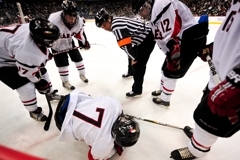 Eden Prairie's Kyle Rau (7) took a hit, but kept on ticking (Photo by Helen Nelson). Back on the big stage, Kyle Rau again captured the spotlight. 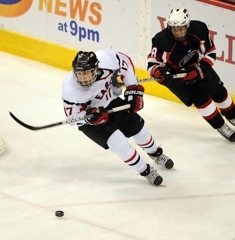 In his three-year high school career, Eden Prairie’s Mr. Hockey favorite has had a knack for the spectacular. Thursday night was no different. With the puck, he’s part P.T. Barnum showman, part David Copperfield illusionist. 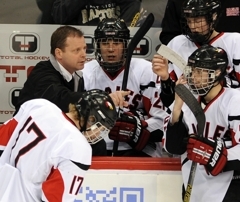 Lakeville North coach Randy Schmitz, whose team ran into Rau and the Eagles twice a year in the old Lake Conference and again on Thursday, March 10, in a the Class 2A state quarterfinals at the Xcel Energy Center in St. Paul, has seen enough of the Rau show. 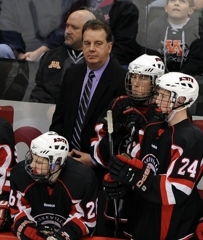 Schmitz and his Panthers were the latest victims to Rau’s magic tricks, falling 5-0 to Rau and top-seeded Eden Prairie (22-5-2). Rau scored twice, pushing his season total to 76 points (38 goals, 38 assists). Midway through the first period while on the penalty kill, Rau took a wide path into the Panthers’ zone, but seemed to be cut off from any good angle by the defense. Instead, he took one stride and exploded past the defender. 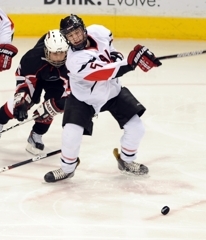 Linemate David Rath saw Rau break and hit him in stride. But Rau didn’t just shoot randomly. Instead, he patiently waited for Lakeville North goalie Charlie Lindgren to commit, then pulled the string and tucked the puck into the net for a 1-0 lead. On a power play four minutes into the second, Rau struck again. He sneaked behind the defense and set up shop on the far post, burying a backdoor pass from Dan Molenaar to push the lead to 3-0. 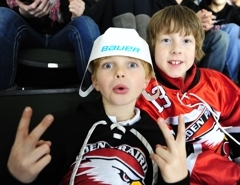 The Eagles also got goals from Andrew Knudsen, Mark Rath and Nick Seeler, who added two assists. 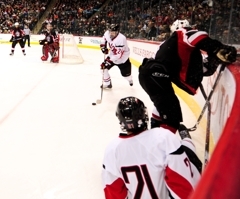 Eden Prairie outshot the Panthers, 37-20, as Andrew Ford made 20 saves for a shutout. 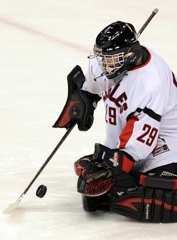 Lindgren had 32 saves for Lakeville North (13-15-1). As Schmitz said, perhaps the only thing that can stop Rau is time. 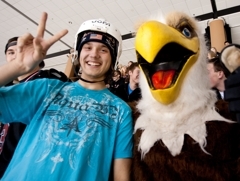 Now a senior, Rau knows he doesn’t have many hours left to accomplish his goals. 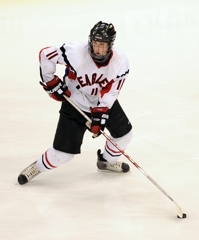 Along with 10 senior teammates, Rau was part of Eden Prairie’s 2009 state championship team. He got a bit melancholy when he was asked about this latest run – his final weekend in an Eagles’ uniform. “This is it,” said Rau, looking around the interview room. 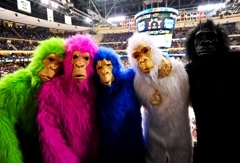 “What a better way to go out than to have a great state tournament. 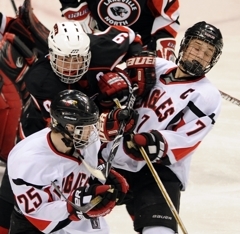 Lakeville North goaltender Charlie Lindgren stops Kyle Rau (7) on the doorstep (Photo by Helen Nelson). It didn’t take long for Lakeville North goalie Charlie Lindgren to become heavily involved in the Panthers’ state Class 2A quarterfinal game against No. 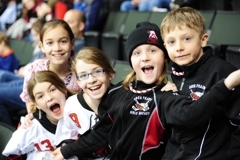 1 seed Eden Prairie. 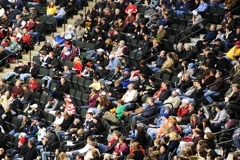 Lakeville North needed every bit of Lindgren’s solid play as the Eagles unloaded 18 shots on goal in the first period, but only managed to slip one by in the first on Thursday, March 10, at the Xcel Energy Center in St. Paul. Often, to get involved in the game, goalies enjoy seeing a lot of pucks come their way. 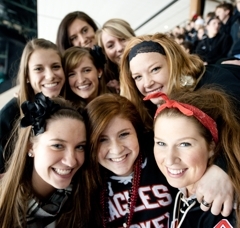 These weren’t just routine shots Eden Prairie was unloading. The prime scoring chance Lindgren couldn’t foil was from the hands of Mr. Hockey finalist Kyle Rau, who buried a shorthanded breakaway by Lindgren. Lindgren made a stunning toe save on Luc Gerdes in the first, when Gerdes had the puck in the slot and what appeared to be a wide open net to shoot at. Even though Eden Prairie won by a convincing 5-0 margin, the Eagles needed to get in tight to score because nothing clean was getting past Lindgren. Andrew Knudsen scored in tight on Lindgren after receiving a perfect pass from Mason Bergh. Rau got his second on the power play on a back-door one-timer while Mark Rath and Nick Seeler provided third period goals in close quarters. 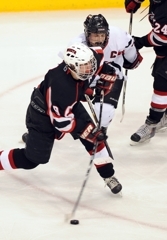 All goals were at or in the Panthers’ crease, with Eden Prairie crashing the net early and often. 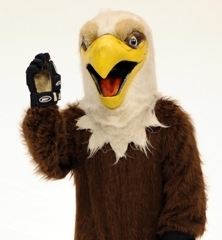 It was the only way the Eagles could get pucks past Lindgren. “He’s a great goaltender,” Eagles coach Lee Smith said. Lindgren finished with 32 saves. 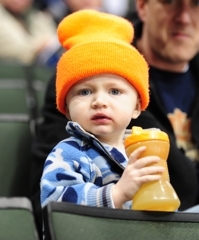 Lindgren has an 11-10-1 record and will have a chance to get his team to the state consolation championship game on Friday, March 11 when the Panthers will play either Eagan or Moorhead at Mariucci Arena in the consolation semifinals. Kyle Rau provided the heroics with a pair of goals to stake Eden Prairie to a 3-0 lead after two periods against Lakeville North in Thursday’s Class 2A quarterfinal. But when he went awkwardly into the boards following a check from behind in the third period, he also provided the game’s only real drama. “I need to take a little ice bath,” Rau said afterward. Ultimately, though, he will be fine — and his team was more than that, dispatching Lakeville North 5-0 and acting the part of the No. 1 seed. “I loved the way we came out with a lot of intensity,” head coach Lee Smith said of his squad, which outshot the Panthers 18-4 in the first period. Rau, the Star Tribune Metro Player of the Year, scored short-handed in the first after taking a perfect feed on a 2-on-1 and tucking the puck past goalie Charlie Lindgren. Sophomore Andrew Knudsen added an even-strength goal in the second before Rau’s tap-in made it 3-0. Mark Rath and Nick Seeler added goals in the third period — both less than a minute after Rau took his spill. Andrew Ford made 20 saves in the shutout victory. The Eagles, who won the 2009 state title when many of this year’s seniors were key sophomore contributors, have 13 seniors on this year’s roster. The big stage didn’t seem to affect the Eagles senior much, as he scored twice drew a penalty and was buzzing around the Lakeville North goal much of the night. Yaaaawn. Just a typical game for the Mr. Hockey finalist and Gophers recruit. For those getting their first glimpse of Lindgren, one of the state’s most respected goaltenders played as good as advertised. Yeah, he allowed five goals, but the junior made 32 saves and couldn’t be faulted on any of the Eagles’ goals, all of which came from close range. A shutout in a state quarterfinal is no small accomplishment, and a handful of Ford’s 20 saves required solid positioning and quick reflexes. 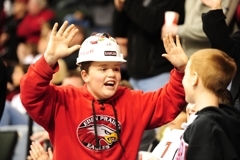 Ford already has won a state Class 2A title as sophomore, and he also won state titles as a Pee Wee and Bantam.